The Highlander Folk School was constantly under attack for its alleged communist affiliations, teachings and personnel. The attacks were of course entirely justified. 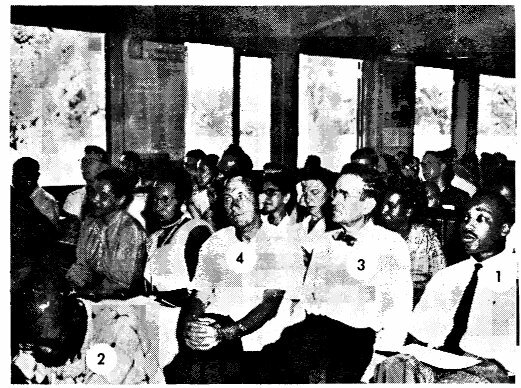 The famous 1957 photo above shows Martin Luther King attending a session at the Highlander School. Person 2 is Abner Berry, a member of the Central Committee of the Communist Party USA. Person 3 is Aubrey Williams, president of the Southern Conference Educational Fund and a close associate of the Highlander School. Williams was identified as a member of the Communist Party in the testimony of two former members of the Party, Paul Crouch and Joseph Butler, before SISS in 1954. James Dombrowski An early colleague of Horton's at Highlander. Dombrowski had also been identified as a member of the Communist Party and as having accepted Party discipline by witnesses Crouch and Butler before SISS in 1954. Carl Braden A long time supporter of the school. Identified as a member of the CPUSA in the testimony of Alberta Aheam, an FBI informant in the Party, before SISS on October 28, 1957. In 1954 Braden was convicted and sentenced to fifteen years in prison for bombing the home of a black family who had just moved into a white neighbourhood. Braden attempted to place the blame on the white neighbours. Braden was released from jail when the Warren court declared all state sedition laws void. Anne McCarty Braden, wife of Carl, pictured at Highlander in 1960. 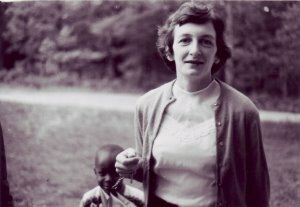 Also a member of the Communist Party, Anne Braden taught at Highlander for many years. She died earlier this year. Her Highlander obituary is here. Pete SeegerThe folk singer was a regular fixture at the school. He is pictured here with Martin Luther King, the Rev Ralph Abernathy and Rosa Parks. A member of the Communist Party from 1942 to 1950, Seeger is still alive and still a Marxist. Today he is a member of a Communist Party breakaway group, the Committees of Correspondence for Democracy and Socialism.